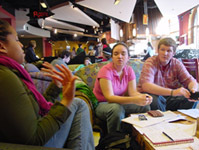 LWAC facilitators and members of CLAP chat in a campus cafe at Notre Dame. Student activists at Notre Dame launched a living wage campaign in September 2005 when CLAP held its first rally, called the "Inaugural Assembly." Students continue to build an alliance with campus workers, faculty and alumni. In addition to demanding a living wage for campus workers, CLAP also demands the workers have a voice in the "Notre Dame family," as currently there is no real way for workers to voice their concerns and grievances. CLAP members want newly-hired univerisity president Father Jenkins to publicly commit to paying a living wage and to form a "task force" to oversee the issue. By May of 2006, students were frustrated by Jenkins' continual disregard for the concerns of CLAP and campus workers. CLAP tried to end the administration's inaction by staging a one day sit-in outside Jenkins' office. The sit-in sent a clear message that the students of CLAP won't let Jenkins & Co. stall the campaign in unproductive meetings and ignore campus workers. Feel free to reproduce, modify, and distribute any information on this website.